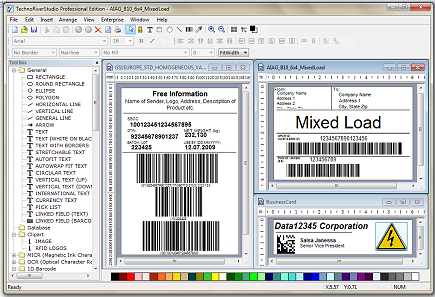 TechnoRiverStudio Standard Edition is an industry-leading label design, barcode and printing software. It offers powerful features like WYSIWYG label design, image acquisition, raster/vector graphics support, Rich Text formatting, advanced print options, circular text and flexible barcode settings. With more than 8 years of history, this software has undergone tremendous improvements, robust testings and refinements to achieve what it is today. ...... GS1-DataBar, GS1-128, S2OF5, UCCEAN128, UPC-A, UPC-E and UPC Extensions. Accuracy and quality are the two key aspects of the barcode engine of TechnoRiverStudio that produce the most recognizable barcodes in the industry. To assist in the design of labels, TechnoRiverStudio also comes with one of the industry largest and expandable Label Stock Database. The Stock Database stores the dimensions of many different labels, and greatly simplifies the task of label design. Whether you are printing hundreds or thousands of labels per day, or whether you have to print on different printers with different label designs, TechnoRiver's state-of-the-art barcode software is guaranteed to provide the robustness necessary in meeting all the demands of your business. With more than 8 years of history, this software has undergone tremendous improvements, testings and refinements to achieve what it is today. The most recent update adds support for double sided (duplex) design and printing. Qweas is providing links to TechnoRiver Studio 7.2 as a courtesy, and makes no representations regarding TechnoRiver Studio or any other applications or any information related thereto. Any questions, complaints or claims regarding this application TechnoRiver Studio 7.2 must be directed to the appropriate software vendor. You may click the publisher link of TechnoRiver Studio on the top of this page to get more details about the vendor.